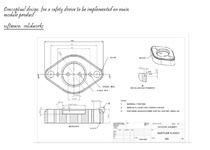 Able to convert your hand drawn sketches into cad models via Solidworks and also produce engineering drawings for manufacture. Listened to instructions and produced what was asked. Great Job! Greg was excellent, he manage to capture my ideas and thoughts onto paper so to speak. He is very professional, and has been ready available to give me updates when and where needed. Greg stuck to the time frame we set, which helped me progress with the project. He is definitely someone i will be using on future projects. He has be simply fantastic. On a final note i would recommend him to anyone as he is highly skilled. Thank you Greg.